Here is a map of the floods with some place names that we've added in order to facilitate describing the location of birds. Note that the actual shape of the floods changes dramatically depending on how much water is around. 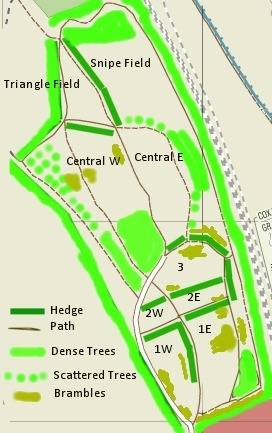 I've also done a map of Burgess Field, showing the main paths, hedgerows and fields. Here is a Google Map that I've made of the area with key points highlighted.